Not so long ago I had what many (including myself) might consider the perfect job. As the founder and operator of an eco-tourism company in Mexico, I spent my days on the beach and on the water, guiding tourists through a wonderland of tropical delights. We trekked through the mangroves, learned to fish with the natives and marveled at the wildlife: crocodiles, iguanas, turtles and countless tropical birds. But the first thing we did each morning, before the first tourist arrived, was to comb the beaches and pick up the trash that had accumulated overnight. On a typical day we might score a couple 30-gallon (114 l) bags of trash — bottles, cups, bags, discarded clothing, plastic utensils, potato chip bags, bottle caps, chunks of Styrofoam, old oil cans and various unidentifiable broken parts. It was a disheartening part of the job. My crew and I always wondered how it was that people could mistreat paradise by tossing their trash there. But trash duty was an ever present, never ending part of business as usual. Truth be told, few people probably disrespected the environment by tossing their trash. More likely it was unintentional — trash dropped accidentally, blown by the winds, washed by the rains, driven by the seas and somehow collecting at the high tide mark. And what we saw there in our little slice of paradise was just the tip of a much larger iceberg: a mounting environmental calamity the extent of which is difficult to comprehend. Somewhere out in the Pacific lies a unique feature. One would think that out in the middle of the ocean, one would find nothing but pristine blue. But here reality conflicts greatly with our vision of paradise. Rather than the clear pristine blue, we find what has been dubbed the Great Pacific Garbage Patch — a floating wasteland of trash roughly twice the size of Texas. Made up of 80 percent discarded plastic, the floating sea of water bottles, Styrofoam cups, discarded fishing line, rope and nets, along with shattered plastic parts and hull fragments creates an eerie, ghostly scene. The first thought that might come to mind when someone stumbles across this pathetic and ugly sight — who put this here? Their vision in part has been realized. Today we find that almost anything and everything is made of plastic: everything from medicine bottles to bread bags, football helmets to foot wear, from bumpers and fenders to gas cans, contact lenses, computers, cell phones, insulation, padding, clothing and furniture, windows, machine parts, automotive interiors, instrument panels and surgical supplies. Without a doubt, plastics have improved our lives and, indeed, we have created a multitude of products that only a few decades ago would have seemed impossible. Lightweight and shatterproof plastic bottles have replaced glass, tin and even aluminum food and beverage containers, reducing transportation costs and saving energy. But there is a dark side to the wonders of plastic as well. As marine biologist and award-winning author Callum Roberts illustrates in his chilling book The Ocean of Life, we are literally swimming in a sea of plastic. Perhaps the most common, prolific or recognized icon of the modern world of plastic is the water bottle. With nearly 50 billion produced in the US every year, they are literally everywhere. Stacked end to end they would stretch the distance between the Earth and the moon more than 26 times or circle the Earth more than 250 times. And there is nothing to suggest a slowdown in production of plastics. In fact, according to federal figures and a 2015 report from the plastics industry, as recently as 2015 the US plastics industry had grown to 1.7 million jobs with total shipments totaling $583.7 billion. More than 300 million tons of plastic is produced globally each year, with only about ten percent of that being recycled and reused. Billions of bottles, a trillion plastic bags, untold quantities of food wrapping materials are among the mountains of plastic products generated each and every year. Through a variety of mechanisms, some of this plastic is finding its way into the oceans. And due to the inherent durability of plastic, it isn’t going to disappear any time soon. While plastics do serve humankind in a magnitude of ways, there are unfortunately some unintended consequences. First is the fact that many plastics contain, or break down into, chemicals that can be harmful to the environment and harmful to health. Contaminants such as bisphenol A (commonly referred to as BPA), flame retardants, styrene and phthalates, are all toxic and, in some cases, carcinogenic. Although considered highly durable, plastics do degenerate over time, breaking into smaller pieces made brittle by sunlight and temperature and eroding due to mechanical wear. Just as broken glass in the sea and surf turns to “sea glass” that we treasure for its beauty and as an artistic medium, plastic also grinds down and polishes to small pieces. Rather than being collected by beachcombers, these fragments collect in the guts of unsuspecting marine creatures. Unable to distinguish between plastic and flesh, many sea creatures fail to discriminate between discarded trash and a life-sustaining food source. The result is that turtles and whales consume plastic bags, perhaps thinking they are jellyfish. The plastic bags clog their digestive systems, causing painful starvation and death. Birds peck at and pick up pieces of plastic to feed to their young. The young then die of malnutrition, their bellies swollen with plastic pieces. But the bad news runs deeper. Artist activists are working with conservation organizations to deploy this potent tool to change thinking about human impact on the environment. Because of the surface chemistry of plastics, a broad spectrum of chemicals will adsorb on or “stick to” plastic, greatly concentrating the chemicals. If you’ve ever opened a bag of packing peanuts and found them “sticking” to your clothing, you’ll recognize the effect. When those plastics are consumed by organisms, the digestive process releases those chemicals, allowing them to build up in the organism’s tissues. As these organisms are consumed by other larger organisms, the magic of bio-magnification can increase the concentrations of the chemicals by orders of magnitude, eventually reaching hazardous levels with the potential for contaminating our food supplies. To make matters worse, many cosmetics and cleaning products now contain micro-plastics — tiny beads of plastic added for its abrasive qualities. These beads are washed up and flushed down household drains, but are too small to be removed by modern sewage treatment systems. The plastic passes through and end up floating in the shallow surface waters, collecting contaminants and entering the planktonic food chain. According to a 2015 report from Worldwatch Institute, an independent research institute devoted to the analysis of global environmental concerns, “Approximately 10 to 20 million tons (9.1 to 18.1 million metric tons [mt]) of plastic ends up in the oceans each year. A recent study conservatively estimated that 5.25 trillion plastic particles weighing a total of 268,940 tons (243,978 mt) are currently floating in the world’s oceans. This plastic debris results in an estimated $13 billion a year in losses from damage to marine ecosystems, including financial losses to fisheries and tourism, as well as time spent cleaning beaches.” The report goes on to note how animals such as seabirds, whales, seals and dolphins can become entangled in plastic matter and floating plastic items such as discarded nets, ropes and packaging materials. Floating plastic becomes a substrate to transport microbes, algae, invertebrates and fish into non-native regions, impacting the local ecosystems. One estimate suggests some 6 million plastic parts and bits find their way to the ocean every day and that doesn’t include the billions of micro plastic particles found in cleansing scrubs and other cosmetic products. So why does as much as 3.5 million tons of garbage, 80 percent of which is plastic, end up floating around a single peaceful gyre in the Pacific? It’s a simple matter of physics. The trash comes from everywhere. Some is lost by ships crossing the oceans, transporting cargo and bringing supplies from one harbor to another. Sometimes cargo containers are lost overboard in storms, split open by thrashing seas, their contents spilling into the sea. Trash is tossed into the streets or into landfills and is picked up by the wind, washed by runoff into rivers and spit out into the oceans. Prevailing winds, caused by unequal heating of the Earth’s surface, blow over the ocean, generating not only waves but surface currents that stretch across regions unbroken by land. Where these currents do meet with the continents, they are deflected and bent by the Coriolis Effect into a circular pattern. The results are major gyres, or circulating patterns, of surface waters flowing clockwise in the northern hemisphere and counterclockwise in the southern hemisphere. Much of what we know about the circulation of surface currents comes from former US Naval Captain Matthew Maury, who gathered an unprecedented amount of oceanographic information into a single volume called The Physical Geography of the Sea. Through his study, the existence of seven major gyres was identified. Additional work by retired American oceanographer Curtis Ebbesmeyer on the movement of flotsam revealed an additional two gyres. 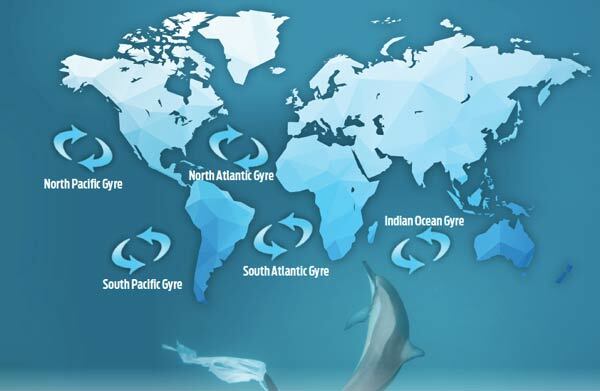 In total, nine major gyres exist and in the eye of each of these gyres we find areas of collected flotsam — including man-made trash — set adrift by both natural and man-made forces. These gyres rotate slowly, completing their circuits in as little as 3.3 years for the Antarctic gyre, to roughly 13 years for the slow Arctic gyres. The Pacific gyres — there are two in the north and one in the south — rotate about once every 6.5 years. Ebbesmeyer’s work not only helped map the flow of surface waters, but also helped put more spin on the subject of floating garbage. With the help of beachcombers worldwide, Ebbesmeyer plotted the final resting grounds of rubber ducks (this is true!) lost by a Chinese cargo ship in 1992 to trace surface currents. Not satisfied, he also tracked the recovery of ice hockey gloves and Nike sneakers lost by cargo ships. As Roberts points out, Ebbesmeyer’s studies of flotsam revealed that roughly half the garbage carried in the surface currents is spit out with each rotation of the gyres. Some of it floats free at the outer edges and is pushed back to shore. The rest is spun off inward and collects in the relatively motionless centers of the gyres. These floating wastelands are growing and will be for decades to come unless we make some serious efforts to reduce them. Returning to Devon, England, she went diving and found the same thing — waters littered with plastic bags and marine life choking on the plastic refuse. Deciding it was time to take action, she booked a gallery in her native Modbury and invited local business owners to a showing of her film. The impact was enormous and it started a backlash against the use of plastic bags. The community decided to ban plastic bags and instead switched to all manner of materials — starch wrapping paper, paper bags, cotton bags — as a replacement. Modbury’s ban on plastic bags wasn’t the first. Similar efforts have been started as far away as India and South Africa. And even here in the US, efforts have been started to limit the post-consumer plastic pile-up. Seattle, Portland and some 120 California towns now have ordinances to limit or ban the use of one-use shopping bags. Likewise, from Washington, DC to Maine, communities ban bags or charge fees to discourage their use. One approach to promote recycling of products, including plastic bottles, is to require deposits be collected as part of the purchase price, which is then returned to consumers when they return the empty bottles for recycling. But even the deposits on plastic bottles in some states and availability of reuseable shopping bags hasn’t curbed the global demand for and use of plastic bags and bottles. Only a quarter to a third of plastic bottles are returned for recycling. According to the EPA, the US uses over 380 billion shopping bags every year, consuming 12 million barrels of oil in the process. And four out of five grocery stores use plastic bags. One estimate puts the annual number of bags consumed globally at the 500 billion to 1 trillion mark. Bottles and bags are just part of the problem. According to an EPA report dated in 2015 (2013 data), only about 14 percent of the 14 million tons of plastic containers and wrapping generated annually in the US is recycled. The rest is lost or discarded and a frightening amount, as we know, makes its way to the oceans. So the question becomes, can’t we do better? One way to get ahead is to simply curb our unnecessary use of plastics and step up our efforts at recycling. The fewer bags and bottles we generate and use, and the more we recover and recycle, the less plastic we will find floating in our oceans. Another way to stem the tide is through technology. Efforts continue toward creating better single-use plastic products — those that will biodegrade and can be composted. As for the Great Pacific Garbage Patch, a glimmer of hope rests on the horizon. As Callum Roberts points out, the ocean gyres do us a favor by concentrating the floating plastic and a few small scale efforts have been mounted to start collecting that refuse. All it would take is the right economic incentive to harvest that plastic for recycling or energy production. In the meantime, the slowly spinning gyres of trash in the ocean serve as a warning sign. And the truth is that we’re all responsible in some part for their existence — for trashing the oceans and creating the floating wastelands. 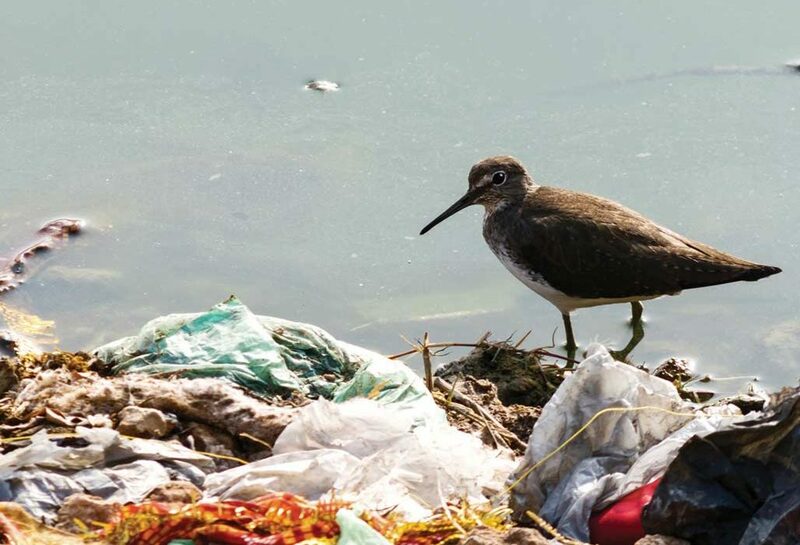 It’s up to us to sound the alarm, bring attention to the plague of plastics that threatens us and take action to change our world for the better. Plastic bags have become a mounting menace. Consider that a typical plastic shopping bag is used for 12 minutes and then takes some 500 years to break down. It’s not the most environmentally efficient use of materials. But finding a replacement or building a better plastic isn’t as easy as it sounds. One of the great hopes for reducing the plague of plastics is to develop new types that are more compatible with the environment. It’s a great idea but the terms used are confusing and the new products offer both benefits and drawbacks. Bioplastics are plastic that contain organic matter, such as corn starch, that reduce the life of the material. An example is PLA (polylactide acid), which looks, feels and performs just like polyethylene and polypropylene used for packaging food. The benefits of PLA are that it takes about one third the energy to produce and it typically breaks down in a matter of weeks, mostly into harmless materials, and generating 70 percent less greenhouse gases in the process. But there is a downside as well. Bioplastics as they break down generally produce more methane — a greenhouse gas some eight times more powerful than carbon dioxide. Some bioplastics require high temperatures to break down, may still take years to break down and may still produce some toxic byproducts. Biodegradable plastics are another story altogether. These are made from traditional petrochemicals but with additives to help them break down more quickly in the presence of sunlight, oxygen and moisture. But unlike bioplastics, biodegradable plastics don’t necessarily break down into harmless materials and sometimes leave behind a toxic residue that can make some of them unsuitable for composting. We may not have the best solution to plastic pollution yet, but as advancements are made in the fields of petrochemical and bio-engineering, the answers may be with us in the not-too-distant future. To learn more about plastic recycling and composting, visit epa.gov/. Americans use about 2.5 million plastic bottles per hour and throw most of them away where they end up in landfills. When plastic bottles are buried in landfills, they can take hundreds or even thousands of years to decompose. Only one quarter to one third of used plastic bottles are recycled in the US. It is estimated that recycling, reuse and composting create six to ten times the number of jobs as waste incineration and landfills. Recycling saves three to five times the energy generated by waste-to-energy plants. Plastic bottles are made from oil — the same oil used to make gasoline. Recycling a ton of plastic saves the equivalent of about 2,000 gallons (7,571 l) of gasoline. Less than ten percent of the cost of a bottle of water is for the water itself. The rest goes to costs such as bottling, packaging, advertising and transportation. Plastic bottles are used for an incredible array of products — water and other beverages, food, cosmetics, cleaning supplies, medicines and more. And once those products are used, the plastic bottles are typically tossed in the trash. The plastic can last hundreds of years or can be combusted to generate energy. Unfortunately, the process of burning plastic releases toxins and harmful greenhouse gasses into the atmosphere. So a better solution to the mountains of plastic bottles is to recycle them. The process of recycling plastic bottles isn’t exactly rocket science but it is pretty clever and takes advantage of modern manufacturing technology. After recyclables are collected, they are separated by a variety of means. Water baths are used to separate floating from non-floating materials; metals are separated using electromagnetic technology; plastics are scanned with infrared sensors to sort by type and color; air jets are used to blast the plastics off conveyors into separate waste streams. Plastic bottles are then shredded, the shredded plastic washed to remove contaminants and the clean shreds melted and reformed into plastic flakes. Those plastic flakes can then be re-melted and formed into new products: everything from bottles to fence posts, carpeting, lawn furniture and even recycling bins. Another growing concern is the rising tide of discarded electronics. Rich in plastics, these devices also contain a plethora of precious natural resources. According to the EPA, every million cell phones we recycle saves 35,000 pounds (15,876 kg) of copper, 772 pounds (350 kg) of silver, 75 pounds (34 kg) of gold and 33 pounds (15 kg) of palladium. To find out more about how you can recycle your electronics, visit epa.gov/recycle/electronics-donation-and-recycling. It’s easy to think there is simply nothing we can do as individuals to turn the tide on runaway plastic pollution or other environmental challenges we face. But in reality, we can have a large collective impact if we take individual action in some very simple ways. Choose the products you buy carefully and strategically. Market forces can help drive manufacturers to adopt policies and practices to reduce post-consumer waste. Recycle your plastic refuse. If your community does not have a recycling program, take action to have one started by contacting your local government and making your concerns known. 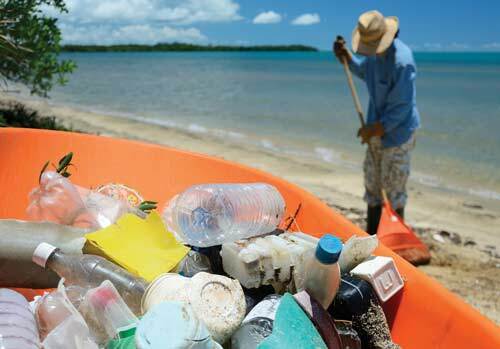 Join a beach cleanup or other activity to help clean up and remove refuse that could make its way to the water. Pick up plastic waste and other refuse and put it in its proper place. Just because you didn’t leave it there doesn’t mean you shouldn’t take a moment to pick it up and remove it from the environment. Carry a trash bag in your gear bag and use it to clean up on dive trips or anytime you’re out enjoying the outdoors. Spread the word. Share this story with others and help bring awareness to the issues.